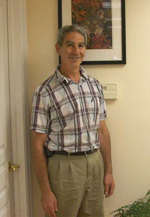 Dr. Gerald Buchoff is a licensed veterinarian and has been practicing for over 25 years. He studied in India and is continually educating himself on the latest studies and data. He believes that it is essential for a practitioner to use all of his/her "senses" during the examination and diagnosis of an animal. He often combines conventional and alternative treatments as well. Please contact our office to make an appointment for a consultation.